From cooking food to decontaminating water sources to simply providing warmth, fire can be an incredibly useful tool for an outdoor enthusiast. And while there are different methods for building a fire when out in the wilderness with minimal supplies, creating one using only friction is a fascinating skill to learn and can be incredibly rewarding. In this survival skills video, expert Zach Gault demonstrates an ancient form of fire-lighting called the bow-drill. Created with soft-wood sources, a bow-drill set consists of a spindle, hearth-board, bearing block, bow and tinder nest. While this method of friction-fire is one of the easier ways to achieve a flame thanks to the mechanical advantage provided by the bow and bearing block, starting a fire with any form of friction can be extremely difficult and labour intensive — especially in unforgiving weather conditions or with a poor selection of natural resources. Check out the video below to see how it's done, then scroll down for detailed instructions on how to master the method. Locate and collect all of the above required materials. When selecting a softwood source, look for exposed sections that are in the sun or receiving the most wind, as these will be the driest parts of the tree. You'll want to use the same source, or ones of similar hardness, to create your spindle and hearth-board. Cut down the source if necessary. When selecting a fatwood source for your bearing block, look for a pine tree with thick, low-hanging branches. Cut down the source if necessary. Construct a tipi fire-lay or other fire-lay of your choosing (having the wood sources ready to burn will greatly enhance the chances of catching the initial flames). Using your hands, shape the tinder nest materials (leaves, grass, bark, moss etc.) into a bird's nest with the driest materials in the centre. Use a finger to create a small indentation in the centre of the tinder nest to allow the ember to be dropped in without rolling. Let dry in the sun or close to your body. From your softwood source, carve out a flat piece approximately 8-13" in length, .5-1" thick and 1-2" wide to act as your hearth-board. This piece of the friction-fire kit resembles a 2x4 and produces/houses the ember. Using a cutting tool, create a small indentation in the board in the location you plan to drill into – this spot is where the diameter of the base of the spindle is burned into the hearth-board. Let dry in the sun or close to your body. From the same (or a similar) softwood source, carve out a spindle approximately 8-12" in length and around the width of your thumb (2 cm). The spindle should be as straight as possible with all bark removed and resemble a pencil – the top end should be tapered to a point (pinky finger size) to help reduce friction in the bearing block, while the other end is carved to a blunt point to maximize friction. Let dry in the sun or close to your body. Safely, using a cutting tool, carve any excess bark off of the branch you're using as your bow. Then, at the base of the bow where your hand will grip, safely carve a ring indentation around the entire circumference. Using a basic overhand knot and wrap, or a similar knot of your choosing, attach cordage around the indentation in your bow – this indentation will help hold the cordage in place. Using a simple noose-knot, or similar knot of your choosing, attach cordage around the top of bow — the cordage should be tight enough to firmly grip the spindle once placed into the bow. Using your cutting tool, safely split the fatwood branch that will act as your bearing block, exposing the gold coloured resin inside (lubricant). Carve a small indentation into the centre of the branch, wide enough to accommodate the top of the spindle. With the entire bow-drill set carved out, find or set up a location that is sheltered from the elements and provides a safe space to begin the process of bowing. Place something underneath the hearth-board to create an effective barrier from moisture and the ground – it should be positioned in a location that allows the user to be comfortable in a kneeling position. Assuming the user is right-handed (use the opposite sides if left-handed), position and place your right knee on the ground directly behind the hearth-board/ The right leg should lay flat and out of the way, while stabilizing your body-weight. Place your left foot comfortably over-top of the hearth-board, locking it firmly in place and bending at the knee. Your posture should be comfortable and non-intrusive. Place your spindle onto the outside of the cordage on the bow, and carefully with both hands twist the spindle around the cordage, locking it in place. With your left arm/hand wrapped around your left knee — locking your left hand firmly onto your shin and gripping the bearing block — place the bearing block onto the top of the spindle and, in the same motion, place the bottom of the spindle into the hearth-board indentation, securing the spindle straight up and down. The spindle has the potential to shoot-out so caution is always recommended. Gripping the bow and using full, steady strokes parallel to the ground, slowly begin to spin the spindle into the hearth-board. Maintain even amounts of downward pressure. This will generate smoke, dust and create the pilot-hole (the spot where the spindle sits). Stop once you see ample amounts of charred dust on top of the hearth-board. Once the spindle has burned in a depression into the hearth-board, carefully place the bow and spindle in a dry location. Using your cutting tool, trace and cut a "V" into the hearth-board, leading just shy of the centre of the pilot-hole. The V notch should be about 1/5th or 1/8th of the pilot-hole circle with clean cut walls (the side it's cut on is dependent on the user preference). Carve any yellowed or shouldered wood away from the hearth-board and spindle — this will help alleviate the spindle from getting choked up in both the hearth-board and bearing block. Remove the blunt or sharp point from the bottom of the spindle – the blunt point is only necessary for creating the pilot-hole. With the hearth-board now fully ready to create an ember, place a piece of dry bark or wood underneath the V notch to act as your ember pan. Assume the initial bowing position and using a light amount of downward pressure — enough to keep the spindle seated in the hearth-board and bearing block — begin to rotate the spindle and slowly generate enough dust to fill the entire V notch. Consistent, even strokes utilizing the full cordage of the bow will help ensure success. Readjust as needed if the cordage loosens or stretches. While bowing, it is important to use technique and not over-muscle the spindle as it will result in early fatigue. Remember to breathe during this entire process. With the hearth-board putting off ample amounts of smoke and the V notch filled with charred dust, start to add more downward pressure and speed. This will add more friction, heat and ultimately ignite the pile of wood dust, creating an ember. Once you see consistent smoke pluming from the dust pile, you likely have an ember. Take your time though, in this stage it is crucial to allow the dust to form together and grow red hot. Once the ember is glowing red from inside the V notch, gently tap the pilot-hole with the spindle, loosening the dust/ember from the notch. Bring the tinder nest to the hearth-board and ember, carefully picking up the pan and transferring the ember into the centre of the tinder nest. Pinching the tinder nest together throughout the process — this will prevent the ember from falling apart and starting to grow in the tinder nest. Gently start to blow into the tinder nest and on the ember, gradually blowing harder, growing the ember and igniting the tinder nest into flame. Safely bring the lit tinder nest to the tipi fire-lay and place it inside, igniting the fire-lay. Always collect extra kindling/tinder and have it on hand, as well as provide ample oxygen to an early fire source. 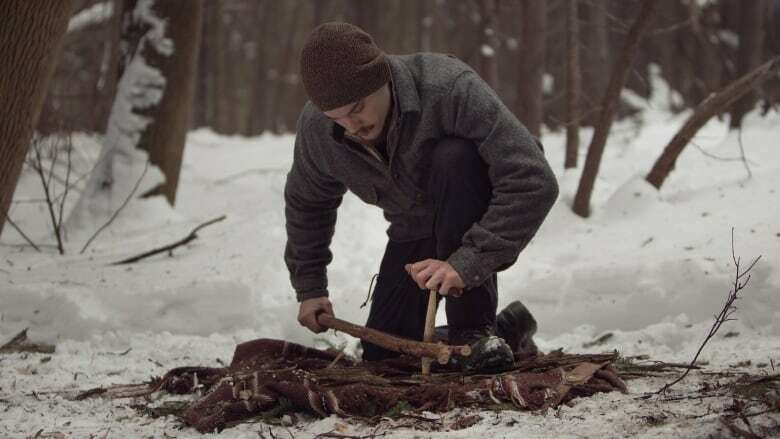 Zachary Gault is a Canadian wilderness-skills instructor and naturalist who specializes in the skills of Bushcraft, Self-Reliance and Sustainable Wilderness-Living. For more info, checkout his website and Instagram. This video was filmed and edited by Trustin Timber Productions. Follow them on Instagram and YouTube for more.